I love this painting. It shows the painter and print maker Marcelin Desboutin next to the actress Ellen Andrée in ‘Le Café de la Nouvelle-Athènes at Pigalle in Paris. This café was also immortalised by Auguste Renoir in his painting Au Café (1877). Although it has a realist style, it was actually painted and posed in the studio. 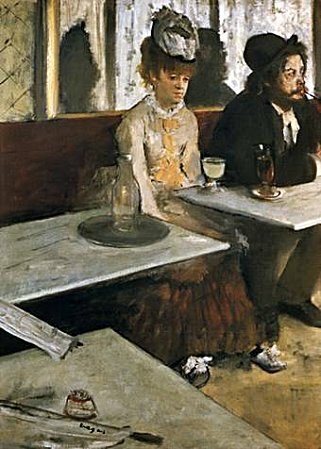 At the time the subject matter, showing a woman drinking absinthe caused great controversy, even disgust. I love the way her feet splay. She sits slumped while a slightly unkempt Desboutin looks away. Mid-afternoon drinking, we see this scene played out today in pubs but in those days, paintings didn’t show real life. Her glass is filled with the characteristique pale green liquid, distilled from the bitter herb Wormwood (actually good to rid oneself of worms). Absinthe is the ultimate underground drink; it was banned for years in most of Europe and was only legalised recently in France. It was associated with a bohemian and artistic lifestyle. Helen Sabin will be coming from Pernod to share ‘La petite heure verte’, tell us some stories and show us how to drink it, possibly from an absinthe fountain. For me absinthe has similar drug-like qualities to tequila, it’s a little bit mysterious and trippy. For this leisurely lunch, Tom Baker will be playing accordion, for we are also celebrating the life and death of the ultimate bohemian, the sparrow like Edith Piaf. Expect French food, great music, and of course, la fée verte. 18th of December 2pm Edith Piaf lunch £40. On New Year’s Eve, Matt Day, sommelier, wine teacher and chef will be presenting five vintage and non vintage champagnes from the house of Mumm Cordon Rouge. Like last year we have a spectacular menu, each course will display the different qualities of champagne: fruit, yeast and spice. Matt and I are still working on the menu but expect a theatrical luxurious epicurean feast to see in 2012. 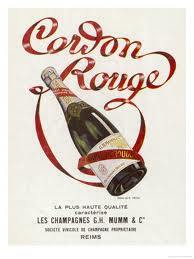 31st December 8pm until late: New Years Eve dinner with Mumm Cordon Rouge £80. Dress sparkly and bring anything else you wish to drink. Luncheon with oysters (1735) by Jean Francois de Troy, believed to be the first time champagne is depicted in art. Interesting post on Absinthe. Whilst doing some research on an unrelated subject this morning, I found a beautiful Art Nouveau poster for 'Robette Absinthe' by Henri Privat-Livemont, on a free vintage clip-art site. Its a popular image that you may already have seen, but I thought I'd send you the link, just in case.